THE Mousetrap is the longest running theatre play in history – with good reason. So says one of the stars of the latest production of the Agatha Christie classic. Louise Jameson – of Dr Who, Tenko and EastEnders fame – is currently appearing as the cantankerous Mrs Boyle in the legendary whodunnit, which has run continuously in London’s West End since 1952. “She’s got the formula absolutely right – it’s an isolated manor house cut off in a big snowstorm, and all the key characters are there,” explains Louise. The Mousetrap has, by far, the longest initial run of any play; passing its 25,000th performance in November 2012. The play opens with the murder of a woman named Maureen Lyon, played out in sound only. The action then moves to Monkswell Manor, recently converted to a guesthouse and run by a young couple, Mollie and Giles Ralston. “The story is so good,” explains Louise. “It came about because Christie used to go to courts and watch the magistrates for inspiration for her stories. “There was this heart-rending tale of a young boy beaten to death and she couldn’t get it out of her mind so she took to her typewriter to get it out of her system. 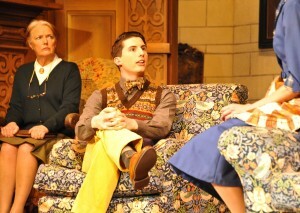 Louise is loving her first piece of what actors refer to as ‘national service’ by appearing in The Mousetrap. The play has never been published in the UK because the author demanded that it shouldn’t be until the end of the play’s first run. It’s also a tradition that audiences are requested not to reveal the twist in the ending – and that continues to this day, even though millions of people have now seen it. It goes down very well – the audience laugh and they really feel part of the play. “It’s fabulous!” says Louise, who made her name playing Dr Who’s assistant Leela in the 1970s before moving on to the female prisoner of war drama Tenko – still her favourite piece of work, she admits. Louise then became an EastEnders regular at the turn of the millennium playing Rosa Di Marco – while she has also starred in other TV favourites, such as Bergerac and Doc Martin. Later this year she’s travelling to America to attend Dr Who conventions and says the Timelord’s fans are ‘the most loyal in the world’. She is also still in touch with her Tenko ‘family’. Her immediate future will be on stage, though, in a very different role from Christie’s Mrs Boyle. “I’m going to play a Welsh homophobic ghost in a play called Viva Drag,” she reveals. Meanwhile, local audiences can catch Louise Jameson in The Mousetrap at the New Victoria Theatre, Woking, from Thursday 14 April until Saturday 16 April.